I swear, I have been suffering from some major attention deficit lately. I’d start doing something, something catches my eye, I turn to it and before I know it, I’ve been distracted at number of times and I had forgotten what I had set off to do in the first place. In the meantime I had wasted a major chunk of time and never really accomplished what I set out to do. That’s kind of what’s been going on in this blog. I now have a back log of recipes that I’ve been meaning to post but just never got around to doing. I can’t regain time lost, but I can pick up where I left off, which is with the grilled chicken skewers I posted over a week ago for LaPiS (which I totally missed this week – sorry, I’ll catch up this Sunday). This recipe was adapted from Japanese Cooking by Emi Kazuko . First, make the yakitori sauce together in a small pan. 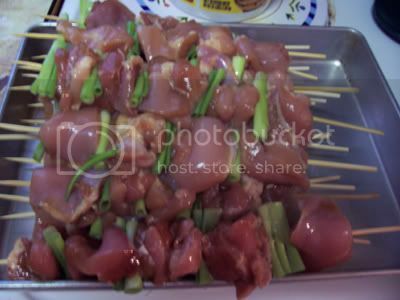 Pour the marinade over the chicken pieces and let it marinade in the refrigerator for at least two hours or overnight. 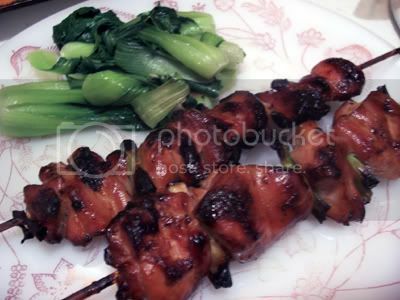 Thread the chicken pieces on the soaked bamboo skewers, with spring onion threaded in between. Place the remaining marinating liquid back into a small pot and bring to a boil for ten minutes until slightly thickened. Pour the Yakitori sauce through a sieve into a small bowl for basting later. Grill the skewers over medium low heat until they are done. Baste with the sauce during the last few minutes of cooking. I’m crazy for grilled food, yum yum yum..
What a perfect main course for a hot summer day. Yum! Mmmm. Looks great, and simple to make, too!